Hayes’ Piper Adkins drives against Licking Heights’ Kaitlin Thompson (12) during the first half of Wednesday’s non-league showdown in Delaware. 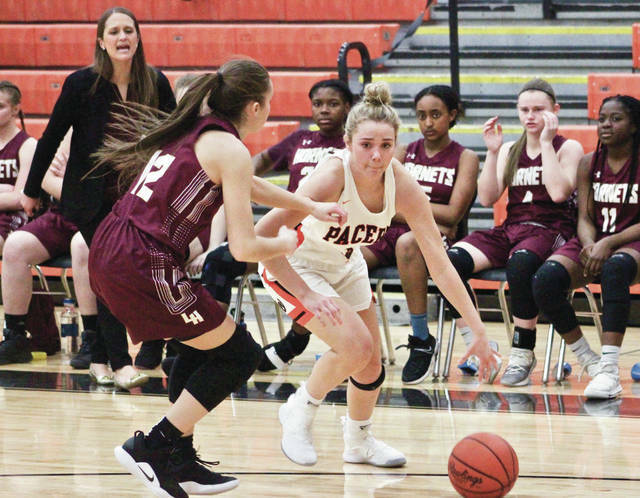 DELAWARE – The Delaware Hayes girls basketball team sent out lone senior Piper Adkins a winner with a 62-53 win over non-league foe Licking Heights in the regular season finale Wednesday night. Alexis Amabile hit six 3-pointers, scored a game-high 28 points and pulled down six rebounds and Jordan Lantz added 15 points and eight rebounds. Amabile hit three of her long balls and scored 11 points in the first quarter and Lantz added six points as the Pacers built a 22-10 lead with 5:39 left in the second quarter. Adkins led the Pacers with seven assists with three of them on consecutive baskets to push the lead as high as 14 at the 3:25 mark of the second quarter. The win gives the Pacers 11 for the season – the most they’ve had since the 2013-14 season (14-9). But the thing that stuck with her at the end was the one thing she got wrong during the game. Izabella Caruso knocked down a 3-pointer for Heights to cut its deficit to 27-16 with 3:13 left in the half and Adkins was called for a technical foul on the play. Kaitlin Thompson hit one of two free throws and Kortnie Starr found Nashala Coffman for a basket to complete the six-point possession for the Hornets. Starr picked up a steal on Hayes’ next possession, setting up Adkins’ redemption when she stepped in front of Starr to take a charge on the ensuing break. It was a sequence that showed just how much the senior has grown in her four years on the varsity squad. The Hornets cut their deficit to six on the next possession, but Katie Smith knocked down a 3-pointer off an Adkins feed to push the lead back to nine and the teams played even from there. Chloe Jeffers led the Pacers (11-11) with 12 rebounds to go with seven points. Smith also finished with seven points. Starr hit four 3s in the second half to finish with a team-high 12 points, Madison Werling added 11 points and Coffman and Caruso chipped in 10 apiece to lead the Hornets (13-8). Caruso had seven rebounds, Werling and Coffman added five apiece and Starr finished with five assists to lead Heights, which is the 25-seed in the upcoming Division I district tournament. Next up, Hayes opens tournament play Feb. 22 at 7 p.m. The Pacers are the 29th-seed in the Division I district tournament and will face the winner of 10th-seeded Olentangy Liberty and 32nd-seeded Olentangy in the second round at the better seed’s site.